Here's our complete guide to all the Perks you can find in Black Ops 4's Blackout battle royale mode. While you're obviously going to be going after weapons first in Black Ops 4's Blackout battle royale mode, don't completely forget about Perks. In our Black Ops 4 Blackout Perks guide, we'll be detailing everything you need to know about the way Perks function in the mode, including a list of the best Black Ops 4 Blackout Perks that you can find around the in-game map. For more on Call of Duty Blackout, be sure to visit our Call of Duty Blackout Guides Hub. It’s got info on the best weapons, places to drop, and a detailed breakdown of the Blackout Map. What are Perks in Call of Duty Blackout? While out looking, you’ll see little green boxes lying around. Pick these up, and you’ll find that they are consumable items that apply effects to your character. These are Perks, and can be used to gain certain advantages. They are limited use, and only last for a short duration. They can be found anywhere on the map, and are very useful indeed. This is incredibly useful to trigger early on, pointing you towards high level weapons and armor. Looter is best used in areas with a lot of buildings. Awareness is one of the best perks in Blackout. It can seriously increase your game, as it allows you to hear enemies from really far away. It's particularly useful in the later stages in the game, allowing you to pinpoint the last few enemies on the map using sound alone. Melee damage isn't a particular useful thing to focus on in Blackout, given that a quick spray with your weapon is much more effective. Brawler is definitely one of the lower ranked perks in Blackout. Consumer is very good indeed, as it essentially lets you heal in the middle of a firefight. It is handy to have in the game's final moments, and could be the difference between a win and a loss. By the time you've heard the audio cue, and have subsequently tied that to the fact that you're being aimed at, your enemy will likely have taken the shot. there are very few situations where Paranoia would be useful, so best to swap it for something else. Being as quiet as possible is a key part of the battle royale genre. You'll want to stay hidden for as long as possible, and Dead Silence will help you do so. Unless you're specifically out looking for vehicles, and they're not particularly hard to find as it is, you'll probably not find Engineer all that useful.It can help if you're looking for a helicopter though. Medic - Heal faster and revive faster. Healing items restore more health. Duration: 240 seconds. Uses: 2. This one is essential if you're running in a squad. Being able to get your teammates back into the action as quickly as possible is vital, making Medic a really great perk. Explosives, razor wire and fire aren't all that common in Blackout, but it's always good to be safe. It's the increased resistance to flashbangs that most useful here. Being able to see teammates through walls really offers no tactical advantage. This is especially true if you're using voice chat. Being able to move faster when crouched is a real winner, eapecially if you're moving away from the circle while out in the open. Moving faster when prone is a plus too. Stimulant is another one to keep an eye out for. Being able to increase your max health for three minutes could really make the difference in the late game, and could just give you an edge over your opponent. This is a very contextual perk, really only useful if you find yourself far away from the centre of the circle. It can save your life in a pinch though, so keep it handy if you think you might need it. Having a little extra breath when aiming down sights with a sniper can be pretty great. It's not really a significant difference though, and snipers aren't all that common in the game. The mobility perk is a jack of all trades sort of thing, very useful for the movement speed increase and no fall damage. Definitely worth using at any point in the match. 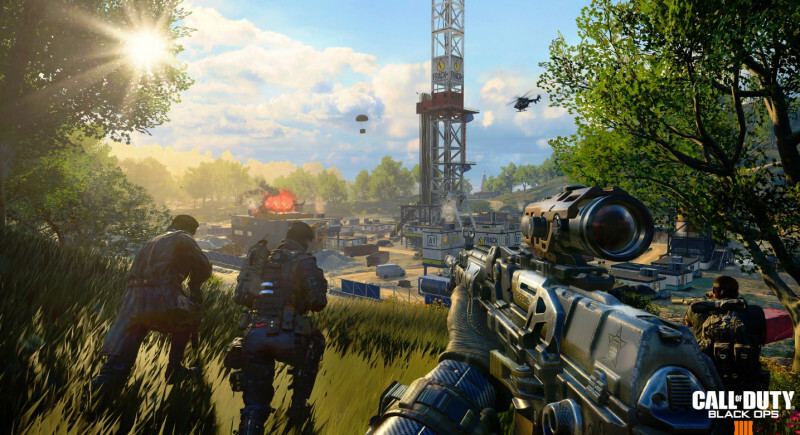 For info on Call of Duty Black Ops 4's Battle Royale Mode, you can head over to our Call of Duty Blackout Guides Hub . For more specific help with the game check out our Call of Duty Blackout Map Guide, Blackout best Weapons guide, how to unlock Blackout characters guide, and our look at the Best Blackout Perks. Awareness - Being able to hear players at greater distances is massively useful for obvious reasons. It makes the late game particularly useful, as you'll be able to pin someone down as soon as they move inside the circle. Dead Silence - Being able to move around the map and open stashes silently is a real bonus, and can make the difference on whether you're able to get the jump on someone or not. Consumer - This perk allows you to restore health very quickly indeed. You could even trigger it in the middle of a firefight - particularly useful in the late game. Tagged with Activision,	Guides,	PC,	PlayStation 4,	Shooters,	Xbox One.